Talk about a tough road trip. 97-78…I don’t even know where to begin. Last night’s game was just plain painful in every aspect of the word. Besides the first quarter, where we showed just a bit of life, they might as well have not even stepped foot on the court. Not once was there any momentum in the Celts favor. 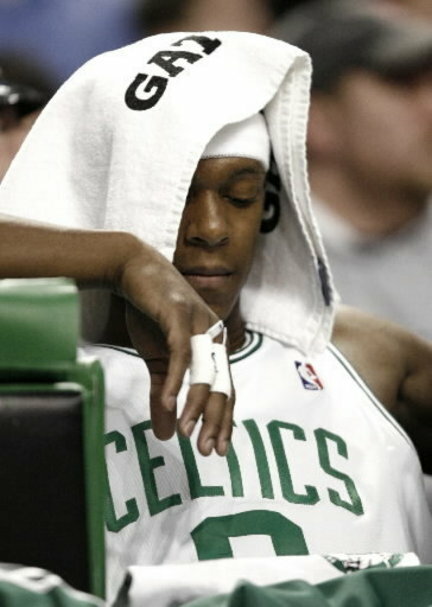 It just goes back to Rondo being the center, figuratively, of the team. The fire just wasn’t there for him tonight like it was the past two games, hence the reason the team seemed so flat. Now, that’s a lot of negativity, and they deserve it, but I’m not losing hope. On a side note, Stiemsma looked great out there defensively, which is the role we’re going to need him to play. Six blocks in the game and solid play on the boards. Anyways, it’s no excuse and I’ve gone to it the past three games, but in the back of my mind it feels good to know that Pierce wasn’t on the court for this. The C’s need his intensity out there. They’re definitely missing the captain. I guess we’ll have to see if they can get back on the right track Friday. Maybe the return of Pierce, mixed with a bit of Mickael Pietrus and a home opener at the Garden will be what the C’s need to ignite the flame. This entry was posted in Celtics and tagged big three, celtics, hornets, loss by jtulz07. Bookmark the permalink.